The Agile P24xM Motor Management Series, a member of the field proven P40 Agile protective relay platform, and has been designed for the protection, control, and management of medium voltage motors in industrial applications. The P24xM series offers a small, flexible form factor, advanced and redundant communications, multiple I/O options, and is available with current inputs (P24NM) or with current and voltage inputs (P24DM). The P24xM series delivers reliable protection for pumps, conveyors, fans, and compressors to ensure maximum process uptime. The P24xM Series (P24NM, P24DM) deliver field proven protection, measurement and control algorithms built from GE’s P40 Agile range of protective devices. The P24NM and P24DM devices offer multi-stage independent protection elements including a variety of curves in four setting groups. Machine thermal imaging monitoring, start supervision, and circuit breaker condition monitoring ensure maximum process uptime and system reliability. The P24xM Series offers flexible and redundant communications options, simplifying device integration into SCADA or DCS systems. Two communication ports are standard - a rear port providing remote communications and a front port for local operators. The front USB port allows the programming of settings, configuration of the programmable scheme logic, extraction and viewing of event, disturbance and fault records, viewing of measurements and the instigation of control functions. IEC 61850 or DNP 3.0 over Ethernet are available when the optional Ethernet port is ordered in the 30TE and 40TE models. Redundant Ethernet protocol PRP, HSR and RSTP are also available in dual RJ45 or dual fiber. The copper physical link option uses RJ45 connectors, the fiber option uses LC connectors. 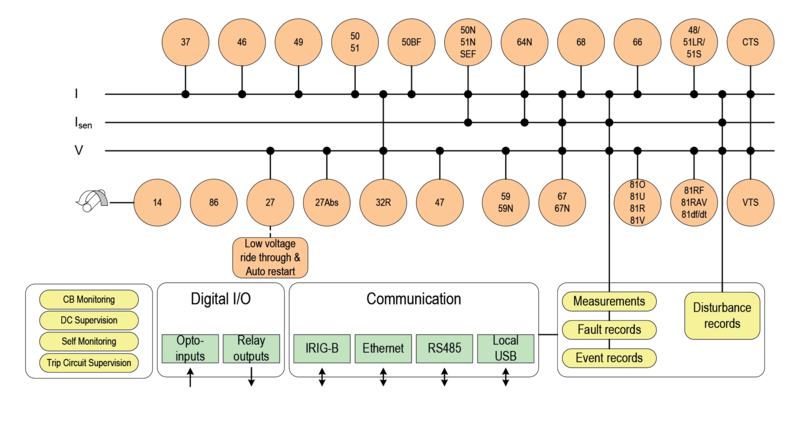 IEC 61850 offers high-speed data exchange, peer-to-peer communication, reporting, disturbance record extraction and time synchronization. 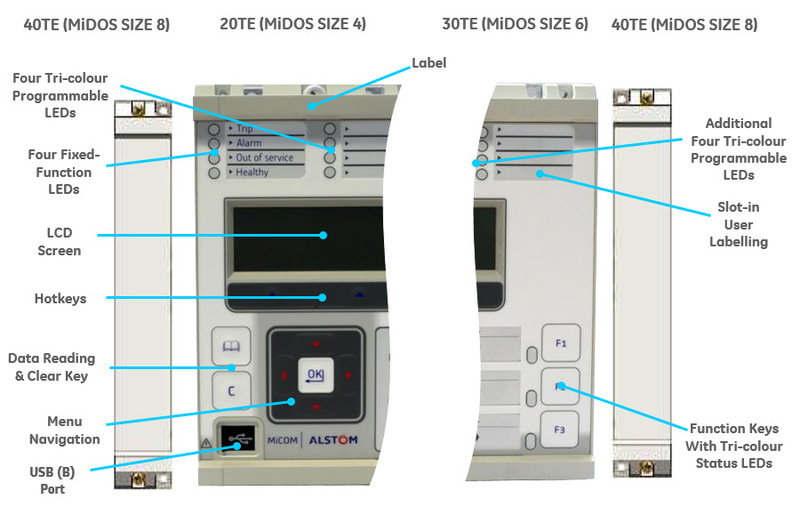 To help smooth transition from the existing protocol to the IEC 61850 protocol, the P40 Agile relay had been designed to provide concurrent Courier, Modbus or DNP3 on the RS485 while provide IEC 61850 over Ethernet port. Setting conversion to the new P40 Agile IEDs. 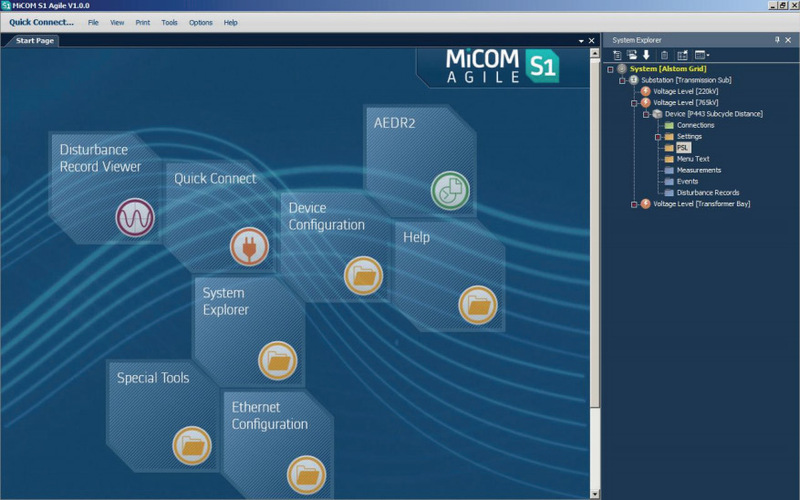 S1 Agile is the truly universal IED engineering toolsuite. No-longer are separate tools required for redundant Ethernet configuration, scheme operational dashboards, programmable curve profiles or automatic disturbance record extraction – all applications are embedded. The front-panel interface allows direct IED interaction. . Integrated user function keys and tri-color programmable LEDs provide a cost-effective solution for control and annunciation.